In the photocatalytic removal of indoor VOCs using TiO2 thin film, our focus is on the enhancement of the photocatalytic activity of TiO2 thin film coated on the metal plate. In this study, we attempt to achieve such an effect by introducing additional paths for the photogenerated electrons, since the flow of photogenerated electrons into additional paths is expected to enhance separation between these electrons and holes, thereby resulting in retardation of rapid recombination between these species. These paths are connected to TiO2 coated metal plate in the form of either an electric circuit or simple grounding, and the validity of the role of these paths for the photogenerated electrons is tested via photocatalytic degradation of benzene in a batch reactor. TiO2 photocatalysts show wide range of photocatalytic activities including decomposition of aliphatic and aromatic compounds and destruction of bacteria both in air and aqueous environment under ambient condition[1-3]. In addition to high photocatalytic activities of wide range, photochemical stability and low cost for manufacture have given TiO2 photocatalysis good prospects for clean technology against environmental pollutions[4, 5]. Despite of much research activities, wide spread commercial use of TiO2 photocatalysts has been slow, mainly due to the large band gap energy (3.2 eV) and rapid recombination of photogenerated electrons with holes. Investigations addressing these problems are on the way, and recently, Anpo’s group have made progress in narrowing the band gap energy in TiO2, thereby shifting absorption spectrum to visible light region up to 550 ~ 600 nm, by using metal ion implantation techniques. These techniques require an ion-implanter of high voltage ion accelerator(150~200 KeV), and the availability and operating costs associated with this ion-implanter are quite formidable. On the other hand, our approach to these problems is to retard rapid recombination between the photogenerated electrons and holes in TiO2. In this study, we will demonstrate retardation of recombination by introducing additional paths for the photogenerated electrons in TiO2. In implementation, these paths were connected to TiO2 coated metal plate in the form of either an electric circuit or simple grounding. 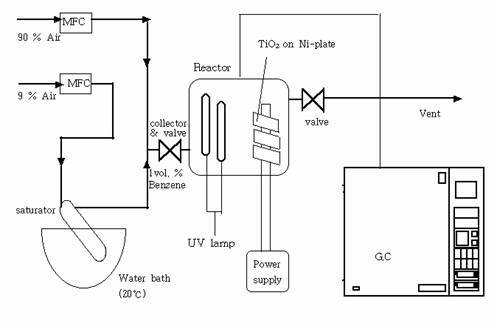 Our photocatalysis system is TiO2 coated Nickel plate under UV irradiation inside a batch reactor, and the photocatalytic reaction is the degradation of benzene. During the experiment, variations in benzene concentration as a function of UV irradiation time were monitored via GC analysis, and any sign of retardation of recombination was looked for. TiO2(Degussa P-25) and 5 wt % KOH were mixed thoroughly using a ball mill, and the mixture was heated to 380℃. This mixture was chosen for coating, since the mixture resulted in better coating on Nickel plate than pure TiO2. Prior to coating, ball mill was applied again to the mixture to produce better coating. TiO2 mixture(1g) was uniformly coated on one side of Ni plate(16.5cm*3.5cm) and was allowed to dry at room temperature. 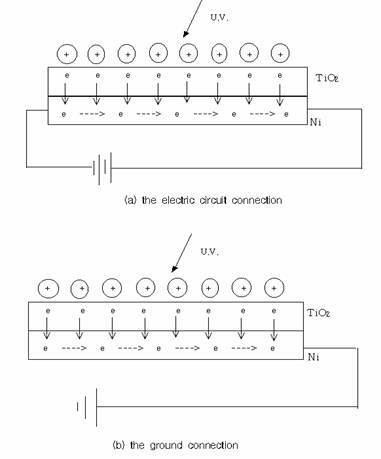 For the observation of the effect of applied voltages on the photocatalytic activity of TiO2 coated Ni plate, electrical connection was made between the power supply and TiO2 coated Ni plate without grounding, and voltages between 0 and 24 V were applied((a) in figure 2). In addition, to see the effect of grounding on the photocatalytic activity of TiO2 coated Ni plate, the plate was grounded with no other electrical connections((b) in figure 2). Photocatalytic reaction was carried out in a 10ℓ batch reactor at 1 atm and at room temperature, and the schematic diagram of the photocatalytic reaction apparatus is given in figure 1. Inside the reactor two UV lamps(8W, Sankyo Denki), a TiO2 coated Ni plate connected to an external power supply, and a fan were installed. Air flowed through a mass flow controller into the benzene saturator placed in the constant temperature bath at 20℃ and 1 atm, and was mixed with 90% air coming from another mass flow controller in order to obtain 1 vol % benzene in air. 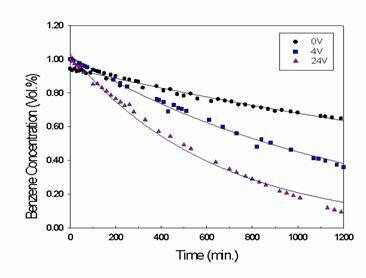 Benzene was chosen among VOCs for the experiment, and the choice of 1 vol % is arbitrary. The benzene mixture flowed into and out of the reactor initially, to allow adsorption to take place in the reactor, and samples of outlet were periodically analyzed with gas chromatograph(HP 6890) equipped with an flame ionization detector and a capillary column(HP 5) to be compared with the target composition. When the target composition of 1 vol % was achieved, the inlet and outlet of the reactor were closed, and the photocatalytic degradation of benzene was carried out in this batch reactor at 20℃ and 1 atm. Throughout the experiment, gas samples were taken at 30 min. interval for GC analysis to monitor variations in benzene concentration. BET measurements on TiO2 and on TiO2 mixture were performed using an instrument by Micrometric Science(ASAP2010), and the results were 57.3288 m2/g and 44.6168 m2/g for TiO2 and TiO2 mixture, respectively. Fig. 1. Schematic diagram of the photocatalytic reaction apparatus. Fig. 2. The electrical connections to the photocatalytic system. The surface area of TiO2 mixture was expected to be considerably smaller than TiO2 due to heating in the course of manufacturing TiO2 mixture; however, BET measurements showed that the difference in the surface area was not significant. In figure 3, the dot symbol corresponds to benzene concentration under no electrical connections to TiO2 coated Ni plate, and the square and triangle symbols correspond to benzene concentrations at 4 volts and 24 volts, respectively, under the condition that external electric circuit was connected to TiO2 coated Ni plate without grounding, and they were collected as a function of UV irradiation time. The curves represent the best fits to the data using a single exponential decay for the purpose of comparison. As shown in the figure, the rates of degradation of benzene increased with the increase in the applied voltages, and the resulting pseudo first order rate constants are 3.24 x 10-4 min-1 under no electrical connection, 8.48 x 10-4 min-1 at 4 volts, and 18.68 x 10-4 min-1 at 24 volts. Fig. 3. Benzene concentration as a function of UV irradiation time with(■,▲) and without(●) electrical connection. In figure 4, the dot symbol also represents benzene concentration under no electrical connection to TiO2 coated Ni plate, whereas the reverse triangle symbol represents benzene concentration under the condition that TiO2 coated Ni plate is simply grounded. The curves represent the best fits to the data using a single exponential decay for the purpose of comparison, and the resulting pseudo first order rate constant under the implementation of grounding is 6.0 x 10-4 min-1. In figure 4, the dot symbol also represents benzene concentration under no electrical connection to TiO2 coated Ni plate, whereas the reverse triangle symbol represents benzene concentration under the condition that TiO2 coated Ni plate is simply grounded. The curves represent the best fits to the data using a single exponential decay for the purpose of comparison, and the resulting pseudo first order rate constant under the implementation of grounding is 6.0 x 10-4 min-1. Figure 4 shows difference in the rate of benzene degradation depending on whether TiO2 coated Ni plate is grounded or not, and it shows clearly that the rate is higher with the implementation of grounding. From figures 3 and 4 the increases in the rate of benzene degradation with applied voltages(figure 3) are more pronounced than simple grounding (figure 4), and the degradation rates are in the following order: degradation under no electrical connection < degradation with grounding < degradation at 4 V < degradation at 24 V.
Fig. 4. Benzene concentrations as a function of UV irradiation time with(▼) and without(●) grounding. In view of the fact that either grounding or connecting electric circuit has resulted in the increases in the rate of benzene degradation, either implementation is assumed to have provided additional paths for the photogenerated electrons to move away from the holes in TiO2, thereby retarding rapid photogenerated electron-hole recombination. If so, separation of photogenerated electrons from the holes is better facilitated via electric circuit than grounding. Moreover, separation is better with higher voltage, suggesting voltage dependent barrier for the flow of photogenerated electrons between TiO2 coated Ni plate and electric circuit. Based on the results of the photocatalytic degradation of benzene, we have demonstrated that the photocatalytic activity can be increased by introducing either external electric circuit or simple grounding. The increase in the rate of degradation of benzene was the highest with the implementation of electric circuit at high voltage. Even at low voltage the rate was higher than that in the case of simple grounding. The increases in the rates are attributed to the retardation of the rapid photogenerated electron-hole recombination by providing additional paths for the photogenerated electrons to move away from the hole in TiO2. Higher rates of benzene degradation at higher voltage in the case of electric circuit connection suggest that a barrier exists between TiO2 coated Ni plate and the electric circuit and that applied voltage works toward lowering this barrier for the flow of the photogenerated electrons. 1. M.R. Hoffmann, S.T. Martin, W. Choi, and D.W. Bahnemann, Chem. Rev., 95 (1995) 69. 2. K. Sunada, Y. Kikuchi, K. Hashimoto, and A. Fujishima, Environ. Sci. Technol., 32 (1998) 726. 3. J.C. Ireland, P. Klostermann, E.W. Rice, and R.M. Clark, Appl. Environ. Microbiol., 59 (1993) 1668. 4. A.L. Dibble and G.B. Raupp, Catal. Lett., 4 (1990) 345. 5. A. Mills, R.H. Davies, and D. Worsley, Chem. Soc. Rev., (1993) 417. 6. M. Anpo, M. Takeuchi, K. Ikeue, H. Yamashita, and S. Kishiguchi, Proceedings of The 8th Japan -Korea Symposium on Catalysis, Osaka Prefecture University, Sakai, Osaka, 29-30 May 2001.